HeRO (Hemodialysis Reliable Outflow) Graft is a fully subcutaneous device implanted by a surgeon that provides continuous blood flow directly from an artery into the central venous system. 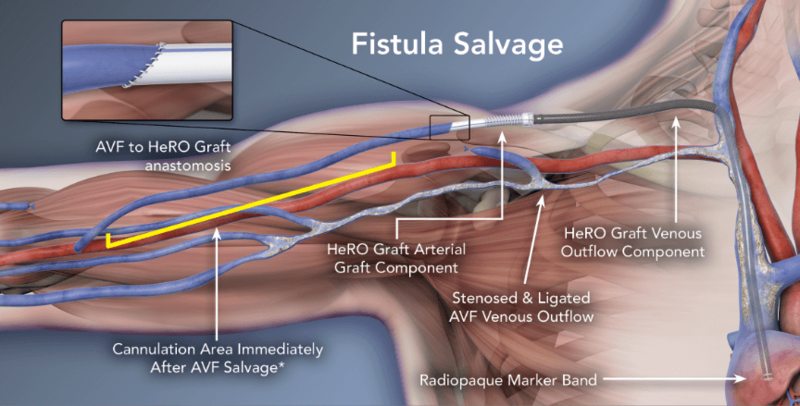 HeRO Graft is FDA classified as a vascular graft prosthesis and is cannulated like a conventional upper arm graft. Follow KDOQI Guidelines for cannulation. LOOK for a uniform sized graft in the upper arm with NO irregularities or aneurysm formations. LISTEN for low pitch, continuous diastolic & systolic flow. HeRO Graft bruit may be softer due to absence of a venous anastomosis. FEEL the thrill. It will be strongest at the arterial anastomosis, but can be felt over the entire course of the graft. HeRO Graft should be easy to compress; however, note that HeRO Graft thrill may be less prominent due to the elimination of the venous anastomosis. Never cannulate the HeRO Graft Venous Outflow Component. To reduce potential infection, remove bridging catheter immediately post successful HeRO Graft cannulation. A HeRO Graft Patient Identification Card is also provided to patients following implant.